Google is sea of free services. Do you know that Google is also hosting jQuery libraries on its CDN(Content delivery network) and allows any website to use it for free. But why to use Google hosted jQuery CDN? 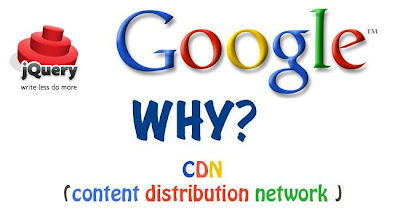 There are 2 ways to load from Google CDN. What if Google CDN is down? It is a good idea to use CDN but what if the CDN is down (rare possibility though) but you never know in this world as anything can happen. So if you have loaded your jQuery from any CDN and it went down then your jQuery code will stop working and your client will start shouting. Hang on, there is a solution for this as well. Below given jQuery code checks whether jQuery is loaded from Google CDN or not, if not then it references the jQuery.js file from your folder.